Recently, the Bloomingdale Fire Protection District No. 1 made legal changes to the District’s Fire Alarm Monitoring Ordinances. The new ordinance requires businesses to maintain monitoring with a licensed fire alarm company for the transmission of wireless alarm signals to the District’s dispatch center. Although the district has assigned its monitoring agreements to a certain vendor, Bloomingdale businesses now have a choice of fire alarm monitoring service vendors. Total Fire & Safety responded with a personal invitation to the businesses asking them to choose Total. We offered an introductory package that included installation, connection and maintenance of a high-quality, 4G wireless monitoring system that is fully compatible with the new ordinance. The offer is available now through February 28, 2014. –Wireless monitoring is faster, while delays can occur with signals reaching the central monitoring system. The consistent, more affordable and reliable system is available now at a discount rate from Total Fire. If you are a business in Bloomingdale, IL needing a vendor to fulfill the new ordinance, we have the equipment and superior customer service you need. 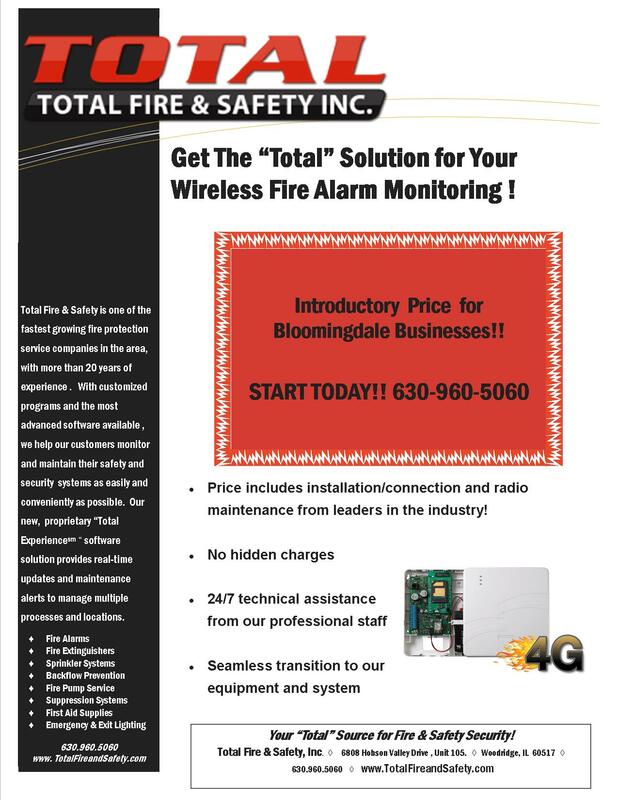 If you know of a business in need of a new wireless alarm monitoring service, please have them contact us at info@totalfireandsafety.com.